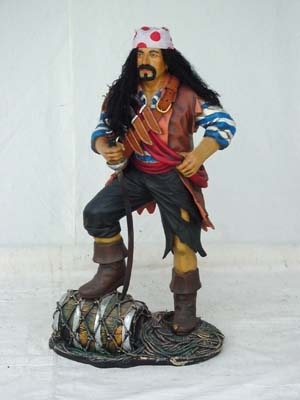 Our 3ft "Pirate Stood on Barrel" Figure is ideal if you do not have room for one of our full-size 6ft figures as he retains the detail of the larger model and still adds a nautical air to any situation. 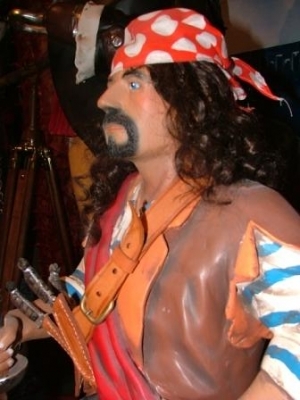 Our swaggering 3ft Pirate Stood with his foot on a Barrel has "real hair", a cloth bandana and has knives attached to his belt. The rope-work around the barrel is so realistic it's untrue. He is ideal for any Pirate themed area, to display in a shop window, or on a counter or would make a fantastic addition to our own home. 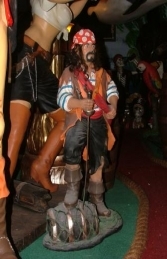 This fantastic half-size figure is ideal for themed areas, advertising or drawing attention to your business. This 3ft tall, resin Pirate statue can be used in any pirate or nautical themed area or in shops, businesses, pubs, restaurants, coffee shops, adventure golf courses, zoos, theme parks or even in your own home.